Gwendolyn plays Dinicu – the music video. Grigoraş Dinicu's Hora Staccato left an indelible imprint on the world. It is a work that is feared and respected in equal parts by violinists. The movement and virtue of this traditional Romanian dance excites. It's complex but sonically and undeniably delightful. Its melody is tenacious and vibrant. Even more compelling than the complexity of sound that the work presents is the verve and dynamic soulfulness with which Gwendolyn approaches and presents the piece. 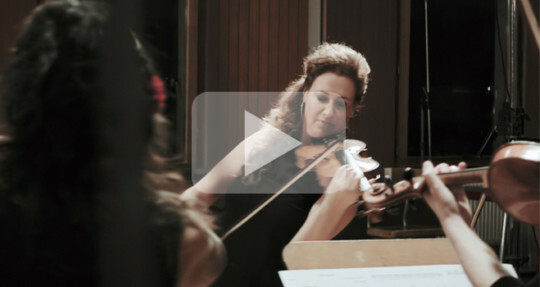 She leads her students and players from the Young European Strings School of Music with her customary badinage and vivacity and presents an electrifying and captivating performance. In this short film, viewers are given the opportunity to be in the hall with Gwendolyn and her ensemble as they play and incite the piece's thrill, interact with the notes and rhythms to experience the undeniable joy and giddiness that Dinicu's work has to offer. This piece was recorded for Gwendolyn's album, ORIGIN. The compositions and improvisations on ORIGIN are those that inspire and have shaped her identity as a musician and artist. The violinist pays tribute to her multicultural background on the album, calling attention to the musical traditions of Central and Eastern Europe and their connection and influence within the ever-changing world of classical music and traditional folk pieces.